The Burgh Works: U.S. added 117,000 jobs in July. Not huge but FAR better than many feared! Previous 2 months revised higher as well! 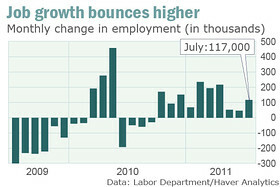 U.S. added 117,000 jobs in July. Not huge but FAR better than many feared! Previous 2 months revised higher as well! WASHINGTON (MarketWatch) — The U.S. added 117,000 jobs in July and the unemployment rate fell slightly to 9.1%, the government said Friday, in a better-than-expected report that appeared to temporarily calm jittery financial markets. The report will reduce fears that the U.S. is heading toward recession,” said Paul Dales, senior U.S. economist at Capital Economics. Yet while employers hired more workers than economists expected, the gain wasn’t big enough to put a dent in disappointing labor-market trends. The jobless rate has stayed above 8% for 30 straight months, the longest stretch of high unemployment since the Great Depression in the 1930s. What’s more, the drop in the unemployment rate in July stemmed mainly from a decline in the labor force as discouraged job seekers stopped looking for work. During times of rapid growth, the U.S. typically adds at least 200,000 jobs a month, but much larger increases would be required for months on end to yank the unemployment rate back down to pre-recession levels.